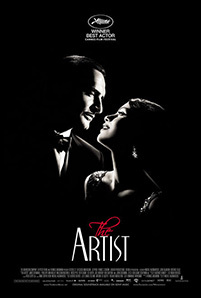 The Artist Wins Best Picture! The black-and-white silent film The Artist won 5 Academy Awards including Best Picture, Directing, Actor in a Leading Role for Jean Dujardin, Original Score and Costume Design. See Jean Dujardin, Berenice Bejo and John Goodman in the movie trailer for The Artist below. Set in 1920s Hollywood, the story follows a vain, silent movie star George Valentin (Dujardin) whose career declines just as young actress Peppy Miller (Bejo) takes the country by storm in talkies. MPAA Rating: (PG-13) for a disturbing image and a crude gesture.